Pilgrimages to Vysova were legalized only in 1930 by the Peremyshl’ bishop Kotsilovskiy on the basis of eyewitness accounts of several people, who had a vision of the Blessed Virgin on a pasture, near a spring in the Yavir mountain. The first pilgrimage to this spot took place under an open sky in 1931 with the participation of many members of the clergy and large crowds from both sides of the Carpathian Mountains. At a later time, a beautiful little tserkva/chapel was erected at this site and also outlined with stones the water spring. This little tserkva (which has survived to this day) was made of wood, and was covered with a tin roof. It had all the attributes of an Eastern Rite Church2: the altar, an iconostas, church processional banners, crosses and icons. After the exile of the Lemkos it was used by the border guards. With the passage of time it became a holding pen for sheep which were grazing nearby while being watched by shepherds - Polish mountaineers, so called "Gooraleh" (Highlanders). This led to the total destruction of the chapel with the exception of the walls and roof which survived until the time when several Vysova families returned to their birthplace [in the late 1950’s]. After extensive petitions and pleas to the authorities, their temple of worship was finally returned to them. While repairing their own destroyed farms, they managed within a short time to rebuild their own chapel on Yavir Mountain. At the present time, a small annual pilgrimage in observance of the Sts. Peter and Paul holiday continues to take place here attended by those Lemkos, who survived spiritually. The Yavir Mountain again was enriched with new visions, which were witnessed not only by Lemkos, but also by passing Polish settlers . Before WW II, the greatest pilgrimages in western Lemkivshchyna took place on the Holy Day of Sts. Peter and Paul in Krynitsia, and the Feast of the Transfiguration of Our Lord, referred to locally as "Spasa", in Brunary. During those days from early morning on the rural roads (foot paths) and major roads, so called "tsisarsky"1 were humming with pedestrians, wagons, processions, everyone singing solemn hymns as they set out on the pilgrimage. Sometimes priests led their own parishioners, but most frequently it was the parish deacon, so called "diak". 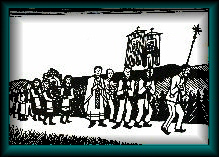 The procession was headed by a distinguished old farmer carrying a cross, followed by a diak, who read a prayer by each road cross or the chapel. Boys carried the church processional banners, while girls carried large church icons. On the road all sang together such hymns, as "Pasly pastyry ovtsy na horee", ("Shepherds were grazing sheep on a mountain") or similar hymns. In good weather, thousands took part in these pilgrimages. Travelling merchants would set up their stands near the "tserkva"2 . Lemkos never "blemished" their fingers with such trade and considered it a great sin to conduct business during such high holidays. But they themselves tolerated this practice by the Jews and Poles. After the Liturgy to the tune of a pipe organ merry-go-rounds creaked happily, whistles blew shrilly, flutes and harmonicas played and everything took place just as it should at a large feast. There were such times in Lemkivshchyna when bells tolled, choirs sang, festivals took place. 1	"tsisarsky", i.e., fit for the Caesar. Roads build during the reign of Emperor Franz-Joseph in Austro-Hungary, prior to 1914. 2	Most eastern European languages have more than one word for "church". Traditionally the Lemko word "kostel" is used for a Roman Catholic place of worship, while the word "tserkva" in used for a place of worship of an Eastern Rite church - whether Catholic or Orthodox. Because no similar distinction exists in English, the word "tserkva" is used in this translation. 3	"Spasa" refers to the Feast (or Holy Day) of the Transfiguration of Our Lord (from Spasytel = Savior), and falls on the 6th of August (New Style/Julian Calendar), and on the 19th of August according to Old Style/Gregorian Calendar, which is still followed by the Orthodox Church. The Feast of the Holy Transfiguration (Spasa) is more commonly called Preobrazhennia. [preobrazytysia = to become transfigured). The Holy Day of the Transfiguration is also known as the Feast of the First Fruits. This is when people bring baskets of fruit to church to be blessed.